August Mahlmann was a Leipzig personality of considerable note, particularly in the publishing trade. After his university education and an extensive European trip, he purchased the Junius Bookshop in Leipzig in 1802 and was managing editor of Zeitung für die elegante Welt as well as editor in chief of the Leipziger Zeitung. In his spare time Mahlmann became a well-known playwright. With his background in the book trade he must have known Schumann’s father; he may even have been a family friend, encountering Schumann fils when still a teenage lad. 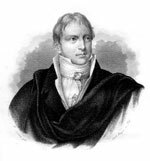 When the first volume of his Sämmtliche Schriften was printed in 1839, thirteen years after Mahlmann’s death, it is likely that the composer immediately acquired a copy.